Stephanie Bange, director of the Educational Resource Center, will help select the winner of the Newbery Medal, honoring the best in children’s literature. Not many adults love children’s literature quite like Stephanie Bange. It’s a love that can be traced to her childhood, when Bange was living with her family on a military base on the shores of Guam, a small tropical island in the Pacific Ocean. Having little to do and nowhere to go, she took to the comfort of literature. But above all, Bange developed a soft spot for books targeting younger audiences. Now a full-grown reader and the director of Wright State University’s Educational Resource Center, Bange’s enthusiasm for children’s literature has only grown. Recently, she was elected a key member of the Newbery Award committee. Named after the 18th century British bookseller John Newbery, the Newbery Medal is awarded to authors of distinguished children’s literature. 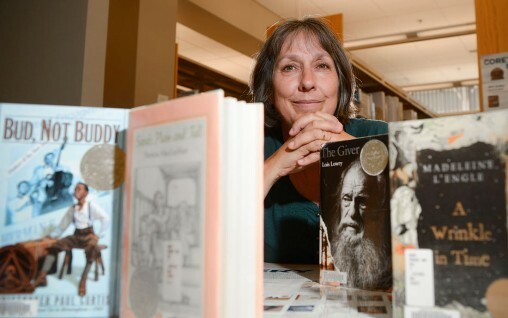 Books such as “The Giver” by Lois Lowry, “A Wrinkle in Time” by Madeleine L’Engle and “Holes” by Louis Sachar are among the prestigious ranks of Newbery Medal winners. “When I found out I won the election and made it on to the committee, I was thrilled,” said Bange. Bange said the committee is incredibly exclusive. She is one of its 15 diverse members, all of whom were either elected or appointed based on career experience in children’s literature. Each member comes from a unique background with a different perspective. The committee’s goal is to decide which book authored in 2014 is deserving of the Newbery Medal and should become an instant classic. Bange has until January to pick her cream of the crop before the Newbery committee convenes to decide which among each member’s top seven books meets the Newbery criteria. And the committee meeting will be much more than a mere book club gathering — intense debates and discussions are sure to ensue. According to the Newbery website, committee members must consider the interpretation of the book’s theme or concept; the presentation of information vis-à-vis accuracy, clarity and organization; development of a plot; delineation of characters and setting; and the presence of any exemplary style. On Feb. 2, 2015, the next winner of the Newbery Award will be declared. In the future, Bange says she plans to spearhead a mock Newbery Award committee among Dayton-area librarians and children’s book enthusiasts.